This installment of the mythic monsters-series clocks in at 30 pages, 1 page front cover, 1 page inside of front cover, 1 page editorial, 1 page SRD, 1 page ToC, 2 pages hot to use/introduction, 3 pages of advertisement, 1 page inside of back cover, 1 page back cover, leaving us with 18 pages of content – so let’s not waste any time! The supplemental content provided in this installment would pertain a variant rule I’ve been using in my home game for years – variant shapes and a supra-colossal size for Kaiju et al. Essentially, standard, tall, long, narrow etc. are provided as easy measurements to make the fighting experience more intriguing. Alongside these handy references, we get Shadow of the Colossus-style rules for climbing creatures of this size, holding on, etc. – and yes, I’ve using homebrew rules to the same effect. Stowing away on the creatures is covered as well and two feats that allow you to climb these brutes can be found. The first creature, then, would be the mythic version of King Kong – at CR 15/MR 6, these creature can deliver devastating, crippling rends and, following the lore, despise kaiju and are particularly adept at destroying them. They may also fly into powerful rages and toss huge objects or creatures- the artwork, which can also be seen on the cover, is neat and supplements a cool build! The CR 23/MR 9 Astral Leviathan may allow creatures to board its cysts and can generate a tide that draws all nearby creatures inside – and carving your way out is hard thanks to the phasing-inducing gullet. Oh, and the movement of these titans disrupts reality itself. The CR 27/MR 10 tempest behemoth can fire scales that can cripple even the healing of the most powerful of mythic casters, may pay mythic power to let all creatures bleeding currently suffer and use mythic power to increase its scale salvos even further – personally, I see SIN from Final Fantasy X when reading this entry- only more visceral and deadly – awesome! At 2 CR less, the thalassic behemoths are not significantly weaker, but their focus is different – with searing clouds of mist and an emphasis on staggering and weapon destruction, the build is just as glorious in its different area of expertise and utilizes some handily reprinted feats from the great installment on Sea Monsters. And yes, where applicable, this applies to all feats. The Shipwrecker Crab at CR 16/MR 6 not only has devastating pincers – it also requires truly big guns to take out – and yes, PCs will shake in their boots as this thing approaches and cannonballs bounce off its carapace… The CR 13/MR 5 brachiosaurus once again has some abilities not bolded and gets straightforward powerful tramples and tail swipes and they may ignore conditions that would affect minor beings. The CR 12/MR 4 tyrannosaurus comes with the giant mythic simple template added as well as notes for the unmodified stats – and is also pretty straightforward: Deadly bite? Check. Deafening roar? Check. But I did not expect the fortified stomach or the option to be a truly relentless pursuer – both are welcome and render this build much more interesting, while still remaining thematically consistent. The dino also gets a cool artwork, just fyi! At CR 30/MR 10, there can be only one – the Tarrasque. 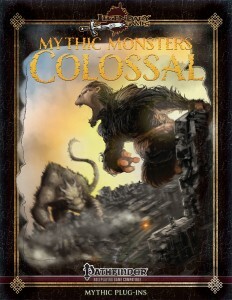 Beyond the expanded abilities from Golarion’s Inner Sea Bestiary, the creature comes with a small artwork (as seen on the cover) -not the most impressive rendition of this titanic terror, but at the same time, this cannot be said about the build itself – clocking in at 2 full pages for all abilities and the statblock, all chock-full with info, this is the singular most impressive tarrasque build I’ve seen in d20. No amount of gushing would properly convey the beauty of this beast – just note that one of the least impressive abilities can net it a total acrobatics of +98. No, that’s not a typo. Giant tortoises, at CR 10/MR 4 are immortal, sentient and smart and can camouflage themselves as islands or hills – yeah, we know the iconic stories – this build supports them. And yes, their shells are very strong! The CR 13/MR 5 zombie titan with its accursed axe, is anathema to divine casters and agents and is accompanied by a zombie plague – nasty! Know when I said that there could only be one at CR 30/MR 10? I lied. The ultimate Grand-daddy of linnorms and kaiju, friggin’ Jörmungandur, Miðgarðsormurinn, the friggin Midgard Serpent would be the new creature herein – while I really dislike the artwork here, this in no way mitigates the awesomeness of the build – the crushing coils truly crush, the death curse wrecks all healing, the creature can consume all magic and it may consume the small ones with AoOs. Its poison transcends immunities. It is accompanied by weather most foul – and its very surrounding area is pure despair and murk. Nigh unstoppable, this superb beast makes for a great, final adversary! Editing and formatting are very good – apart from the minor bolding glitches I noticed, I saw no significant issues. Layout adheres to LG’s two-column full-color standard. One should not be remiss and mention the excessive amount of new, full-color artwork provided for most creatures herein. The pdf comes fully bookmarked for your convenience. Jason Nelson, Jonathan H. Keith and Mike Welham delivered in spades in the “unsexy” bug-book: Here, a designer has his work cut out: I mean, seriously, how can you NOT make these awesome, titanic foes cool? They are awesome by virtue of existing. At the same time, they had to cover a lot of bases and keep these beasts challenging for the powerful heroes that will inevitably face them. The builds are complex and fun and achieve this goal – the creatures contained herein are all killer, no filler: The more magical creatures have a vast array of iconic options. The less iconic ones follow the design-style paradigms for animals etc. and thus retain a sense of continuity that represents the icing on the cake. While personally, I like the installment on bugs slightly more due to the difficulty it posed, this is nonetheless an excellent, superb installment in the series and well worth a final verdict of 5 stars + seal of approval. You can get this awesome installment of the series here on OBS and here on d20pfsrd.com’s shop!